We have new features for you! We know it has been a while, but we guarantee it was worth waiting for. We have implemented some long requested features, which will not only help you better and more efficiently track your time, but also help you work more efficiently. A highly requested feature is now available in the web app. You can pause your stopwatch and resume it at any time. It is also available in the agenda! 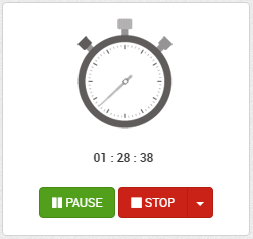 Just start the stopwatch and in case you have a phone call or some interruption, click on pause and when you are ready to work again, just click on Continue. It’s so easy and will save you time as well as help you track your time more accurately! In case you decided to deactivate your account because you didn’t need to track your time anymore or other reasons, but then decide to come back to primaERP within 90 days of the deactivation (we knew you would! 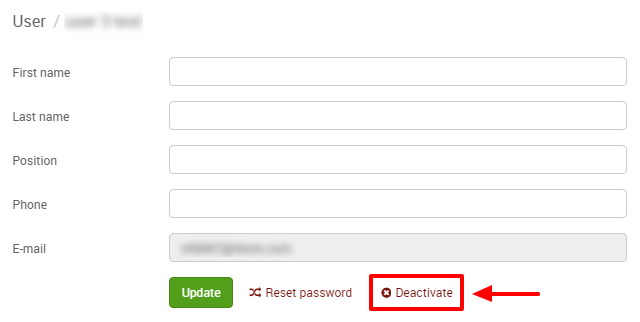 ), you can now reactivate your account at any time in the account settings. Just log in as usual and click on Reactivate in the account settings- that’s it! Your back! As there have been several questions about deleting a user, we have now decided to have only the deactivation feature. This allows you to deactivate the user, which frees up one slot in the license but keeps all of the user’s data. We think this is better than deleting the user and all of its data, as this can affect projects, clients, numbers, etc. As always, we have also done some bug fixes in Billing and in the creation of the users (a name is now mandatory) and have also improved the performance of the software. We hope you like these new features and are looking forward to your feedback! This allows you to deactivate the user, which frees up one slot in the license but keeps all of the user’s data.. The proposal is deactivate users apollyon-class, one of the three SCPs of that class. It's essentially an inevitable, unavoidable doom hanging overhead. It can't be deactivated, prevented Buy Cheap Essay Online or stopped, and remains a terrifying possibility every time you look up. We provide coursework writing services in New Zealand at a very affordable price. We have experts that will write your coursework and check your coursework 3 times before giving you. So buy coursework new Zealand today.